I love pastries, so when I heard of this cafe near my workplace that serves only tiramisu - in many different flavors, I knew I had to have a slice. Well, looking for this tiny cafe named L'atelier Tiramisu was not a piece of cake, though. 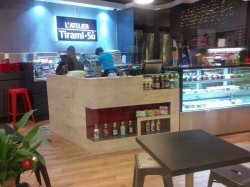 Located at 6 Eu Tong Sen Street, #B1-09 Singapore 059817 (Tel: 9389 8582), this quaint little cafe in warm, enigmatic hues of black and red, serves four exquisite flavors of the classic tiramisu. The ambience is cosy and welcoming, perfectly peaceful for one to indulge in delicious pastries and do a little afternoon chilling out. Everything looked good in the shelves but I was debating what to eat, since I had just finished lunch. 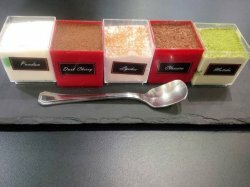 The tiramisus come in four distinctive flavors - Classic, Matcha, Dark Cherry and Lychee. I could not decide, therefore decided to go for the Sampler's portion - four minis in one, just simply perfect. 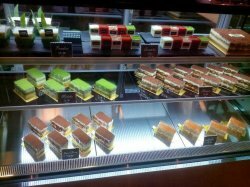 A slice of Tiramisu is SGD$6.80 and the Sampler's portion is SGD$15.00 (with an additional Pandan flavor). First, the Pandan flavor - it was resplendent of the soft fragrance of pandan but tasted more like Oneh-Oneh (a Malay / Asian kueh) than tiramisu. Needless to say, it wasnt a loss that this flavor doesn't come in large slice. Next, the Dark Cherry flavor - rich, sweet, with tiny pieces of real cherries within the strong aroma of good coffee and tiny hints of liquer. Being a cherry lover, this definitely rocked my tastebud. My next favorite has to be the Lychee flavor - a moist, sweet serenade mouthful of bliss. Lychee has a very distinctive sweetness, blended with the soft-sandyness texture of this cake, the combination was simply divine. Classic came next - an explosion of rich, smoothness of Liberty coffee infused with sloshes of liquer with marsala wine, this palatable flavor leaves one hanging around for more. Finally, the Matcha (green tea) flavor - a lovely creation of moist, soft, creamy delight that boosts of the healthy, slightly-"veggie" taste of green tea - it felt deceitfully healthy enjoying this delicacy.